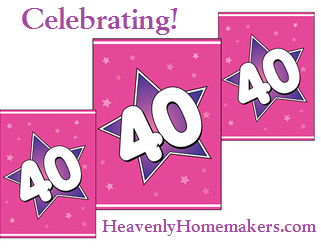 I wanted to include a recipe or two in my Celebrating 40 festivities. But how was I supposed to do that when everything about the celebration has to do with the number 40? I don’t have any recipes with 40 ingredients (you’re welcome). I decided that the exact opposite of a recipe with 40 ingredients is a recipe with only 5 ingredients. Sort of. So I am including this High Five Recipe in my celebration. It’s one of the easiest and quickest you’ll ever make. Stir all five ingredients together. Press mixture into a 9×13 inch baking dish. Bake at 350° for 10 minutes until ingredients have melted together and become lightly brown. Cut into bars while hot. Beyond eating these bars as is, we have also discovered that crumbling one onto a bowl of vanilla ice cream is incredibly delicious. Need more High Five Recipes? (high quality recipes, five ingredients or less) Find lots and lots of them here! That sounds similar to what I use for the topping of an apple crisp. Yum! I just took these out of the oven and they smell amazing! I cut them and there’s no way these are going to hold together so I can take them out of the baking dish :( Any suggestions? I don’t think I missed anything but I did replace the sucanant with coconut sugar so maybe that’s what did it. Next time maybe I’ll try maple syrup instead? You didn’t do anything wrong. 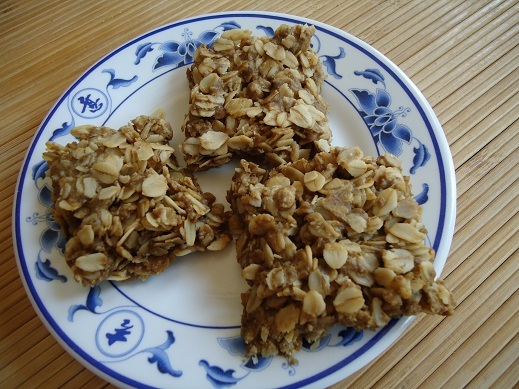 Ours were more bar-like at first, then turned crumbly fairly quickly. We ate them fresh when they weren’t so crumbly, then used the leftovers to crumble over ice cream. SO good! Do they stay chewy? Just wondering. You amaze me with your recipes. Thank you Laura! They get a little bit crunchy, but stay a little chewy too. A fun combination! These look good, do they stay chewy or get hard, and do they need to be kept in fridge ? They get slightly crunchy, but stay chewy too. I store them on the countertop. Laura, how about 8 High Five Recipes? That equals 40!! Could I use honey for the sweetener and in what proportion? Yes, I believe that would work great. Maybe go with 3/4 cup of honey? Just left msg., but had a question…Laura is there suppose to be Caramel Sauce in this recipe, or any brown sugar as it does say caramel oatmeal bars ? The sucanat and butter give them a caramel flavor! These look really yummy and simple, too! I am looking for a good crunchy granola bar too. I’m sorry. They never stuck together, ever. :( any ideas? Don’t worry we ate them fresh too. We just grabbed a spoon. Well bummer. I guess the oil just doesn’t work as well as butter in this case. Hope the crumbles still tasted good! I’ll try our vegan butter next go round. Thank you for these quick recipes that don’t have ingredient lists a mile long. It’s so disheartening to see a picture of a delicious food only to find that it uses many, many ingredients — that might be fine for a special occasion, but it gets tiresome in everyday cooking. Short recipes like this are welcome sights. Do you think they would stay together better if we added an egg white or 2? I’d like to make them for church and I can just see bits and pieces all over the floor. I have to try the whites to see if they will stick together better. I’ll let you know if it works or wrecks the scrumptiousness. Would you serve these for dessert, snack, or breakfast? They look yummy but I wondering if they should be reserved for dessert. I need to make some of these dairy free for my 9 year old who is going to mega sports camp at church this week. I am going to use palm shortening and add a bit more sea salt for flavor, since the shortening doesn’t have the flavor butter has. I think the shortening will help keep them from crumbling as much as they would with coconut oil. Will let you all know the results soon! They would not hold together at all. But it makes good granola! Oh Yum!! I just made this, but converted it into a “High Seven” recipe. I added 1 cup sliced Almonds and 1/2 cup mini chocolate chips. Delish! Mine did not hold together either, even when warm, but am thinking about serving mine over yogurt. Mine fell apart at first, but after cooling, they held together like a bar. I added ground flax and mini chocolate chips. I’m allergic to peanuts and I’ve been searching for a substitute recipe for those chocolate no-bake cookies and this was pretty close. I also dusted it with cinnamon before baking. Thanks for providing the recipe! Oh, wait. I just realized that we used turbinado instead of sucanat. Wonder if that made the difference…..
Do you think I could use Maple Syrup as the sweetener? I don’t have any sucanat or honey on-hand! So, my pregnant brain just screamed OMG! MUST MAKE THESE NOW!!! I mashed up a couple bananas to mix in and pressed it into the bottom of a muffin tin, put a teaspoon(ish) of homemade peach preserves in the center of half and a teaspoon(ish) of peanut butter in the other, then topped with remaining cookie mix. For the peanut butter filled ones I mixed some chocolate chips into the cookie dough before topping. (Did I mention I’m pregnant for all those going eeewwwww gross). Can’t wait until it comes out of the oven!! !